Sumner-Smith, Karina. Towers Fall. Talos, 2015. You can buy it here in one month, starting Nov 17, 2015. 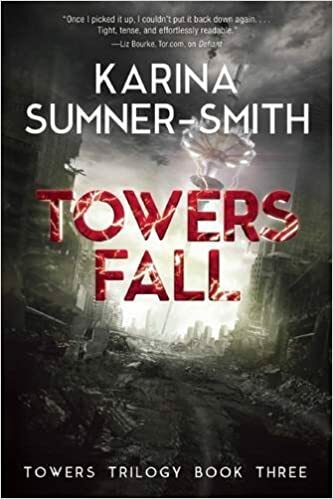 Xhea and Shai have already been through quite a lot by the point Towers Fall begins. They’ve experienced wild swings in fortune, like Xhea’s physical deterioration, especially her knee, which was more or less literally crippled during Defiant (book two), and yet they managed to overcome serious adversity and carve out a kind of improbable victory, a stability, and a stronger-than-ever friendship. Given how well, on balance, the second book ended, how was author Sumner-Smith going to up the ante for the concluding volume? She hit upon a solid, if not totally satisfying, device to handle this: we get Xhea’s power re-bound, with she and the entire Lower City under the shadow of the Central Spire, which seems more and more sinister and even, ultimately, starkly evil. Oh no, I began to think, she’s turning the story into a morality tale with faultless heroes and irredeemable villains! But, without giving anything away, I can happily say that she neatly subverts this easy, melodramatic path and delivers a far more satisfying, because less typical, conclusion to the story. I think this successful conclusion is partly due to the unique relational structure of the trilogy, which hangs emotionally on the obviously non-sexual (only one of them even has a body! ), if not necessarily platonic, friendship and love between the amazing Xhea and the apparition Shai. Since there is no sexual conflict or love triangle driving the narrative, no one needs to be eliminated in order to ‘resolve’ the story in a melodramatically satisfactory way. Instead, they can chart a less absolutist, less violent path towards resolution. On the other hand, if we look at the story through Joseph Campbell’s eyes, taking an unconventional path towards triumph means the ‘boon’ is less cataclysmically impressive (i.e., not much stuff, on balance, gets blown up), yet the cost of this sideways victory, it is implied, is quite steep. I’m deliberately being circumspect here with my words, because it’s a book and a trilogy you should all read, and I don’t want to spoil it for you! Sumner-Smith ramps up the relationship between the two principals, bringing them to realize that their main—their only!—reason for living (or in Shai’s case, not dying all the way) is the love and loyalty they feel for each other. They both decide they do indeed have something fighting and, if necessary, dying (for Shai, dying all the way) for: each other. It’s a wonderful bond they have, and handled well by the author, who hints at, or at least allows the possibility for a romantic dimension to their love without, of course, suggesting any actual romantic “yuri” pairing is possible (given Shai’s non-corporeal state). But then again, could there be any purer love then the kind they feel for each other? None of the messier eros side of love is even possible between them. Perhaps I haven’t done a very good job of explaining how and why the story succeeds as well as it does, and if so, then just take it on faith: it’s good stuff! See details of our unusual scoring system (in which an 8 = very, very good indeed) here. Zhaoyun, lover of love in all its forms, has been writing reviews and taking names at Nerds of a Feather since 2013.